Tune in weekdays 7 p.m.- 8:00 p.m. PT for the latest MLS news with your host Dave Denholm! LAFC remain atop the MLS with a 2-0 win over FC Cincinnati. Dave talks with LAFC.COM's Vince La Rosa on this edition of Black & Gold Breakdown. Do we really have to wait till July for LAFC and LA Galaxy to meet? The best team in MLS is.. Dave Denholm breaks down why the Black & Gold are the best team in MLS. LAFC Defender Steven Beitashour calls in to talk about the new podcast Back to Back hosted by Beita and teammate Jordan Harvey. Plus, Stoppage Time. Reaction to the dominating 5-0 win for LAFC in San Jose. Dave is then joined by LAFC manager Bob Bradley, as LAFC sit atop the MLS standings. LAFC defender Jordan Harvey calls in to talk about his new podcast "Back to Back" with himself and teammate Steven Beitashour. LAFC sits on top of the West after another late game winner, Dave reacts. ESPNFC's Tom Marshall calls in to talk El Tri and why Carlos Vela was left off the Mexican squad. LA Rapper Stix joins Dave for the Black & Gold Breakdown. The voice of LAFC Dave Denholm is back with Soccer Weekly as he breakdown the 2-2 draw against NYFC. Also, LAFC defender Walker Zimmerman stops by for the Black & Gold Breakdown to talk about the season thus far. Plus, all the latest news from MLS and more. Dave opened the show talking about LAFC's perfect 2-0 start in the 2019 campaign. Also, is there a player more talented than Carlos Vela in MLS? Then, Dave explains why LAFC defender Eddie Segura is the real deal. Plus, Stoppage Time with producer Mario. Dave came out "firing on all cylinders," as he talked about the Good and Bad from LAFC's victory over Sporting KC in their first game of the regular season. Also, F Adama Diomande came on with Dave to talk about the win vs. Sporting KC and what to expect on Sunday vs. the Portland Timbers. And, Josh Guesman of the "Corner of the Galaxy" Podcast gave us an update on the LA Galaxy, as their season just kicked off as well. Plus, "Stoppage Time." LAFC defender Steven Beitashour calls in to talk LAFC Season 2, We Are LAFC on ESPN%2B, fatherhood, and much more. Dave Aracelli Villanueva from @MLSFemale & MLS Soccer.com has a preview of the season opener between LAFC and Sporting KC. Plus, Stoppage Time! Why are people so fired up about one result in CONCACAF Champions League? Denholm explained. Then, ESPNFC's Sebastian Salazar calls in for an MLS Eastern Conference preview. And, Vince La Rosa from LAFC Digital joins Dave for Black & Gold Breakdown. Plus, "Stoppage Time!" Dave is right about VAR again! TV voice of LAFC Max Bretos calls in with the latest from LAFC Training Camp and a preview of the second season for the Black & Gold. Plus, Stoppage Time with Producer Mario. Is David Beckham the right man for the first ever MLS player statue? LAFC Defender Walker Zimmerman tells Dave Denholm all about USMNT Training Camp and LAFC Training Camp. Dave talks about the Champions League Round of 16. Plus, "Stoppage Time!" Dave Denholm started off the show saying that the MLS has "turned the corner" as far of it's expanded talent pool. Denholm also had some thoughts on the US Men's National Team and why he won't watch the team in person. Plus, Dave recapped LAFC's friendly vs. Vissel Kobe. And, "Stoppage Time." Could Barcelona's pursuit for LAFC forward Carlos Vela be over now that Kevin-Prince Boateng is with Barca? LAFC.COM's Vince La Rosa calls in with the latest from LAFC Training Camp. Also, Denholm has his eyes on a few local players in camp with the USMNT. Plus, "Stoppage Time." Dave Denholm is getting pumped for the 2019 MLS season and talks with new LA Galaxy General Manager Dennis te Kloese and LAFC Defender Jordan Harvey. And, what is the deal with the rumors of Carlos Vela to Barcelona? Plus, Stoppage Time and much more. Dave Denholm is like a kid in a candy store looking over the new 2019 MLS Schedule. LAFC Radio & TV Host Mark Rogondino calls in to pick out some of the bigger games for LAFC this upcoming season. El Tri officially have a new Manager. Plus, Stoppage Time with Mario Ruiz. Dave Denholm is ticked off at American Soccer fans for worrying Christian Pulisic might not make it at Chelsea. ESPN FC's Craig Burley calls in with some question marks about the Pulisic move. Plus, Black & Gold Breakdown with Ryan Wallerson and Stoppage Time with Mario Ruiz. Dave Denholm starts the show with breaking news as the LA Galaxy hire a new manager. A 2018 soccer recap and end of year awards. Dave tips his hat to the successful LAFC season but stresses they must come back stronger to maintain their momentum. Also, Dave explains his dislike for the Premier League before going into a solo stoppage time. Zlatan is staying! Dave Denholm is joined by ESPNFC's Tom Marshall to talk about Club America winning the LIGA MX title. Now that Jose Mourihno has been sacked, will LA Galaxy go after him? Plus, Stoppage Time with producer Mario Ruiz! Atlanta United wins the MLS Cup in only it's second season, Dave Denholm reacts. LAFC Radio Pregame Host Pablo Alsina joins the show to talk Copa Libertadores, LAFC and more. What does Dave think about new LA Galaxy GM Dennis te Kloese? Dave started off the show wondering who will win this Saturday's MLS Cup: The Atlanta United or the Portland Timbers? Plus, ESPN's and Youtube TV's Max Bretos called in to talk to Dave about the MLS Cup and the MLS Expansion Draft. Dave also had something to say about the MLS Awards and Josef Martinez being named MVP. Then, "Stoppage Time." Dave is back for another edition of Soccer Weekly as the MLS Conference Finals had its fair share of drama for the Red Bulls and Timbers. Also, it is utter chaos in the Copa Libertadores while Dave digs into another Black & Gold Breakdown with the latest on LAFC. Plus, Dave is joined by Calen Carr talking MLS Playoffs. Dave Denholm discusses the rumors about who is going to take over as the manager for the US Men's National Soccer Team. ESPN soccer reporter Sebastian Salazar joins Dave to discuss the losses against England and Italy. They also discuss where Christian Pulisic could end up. Dave discusses the latest with LAFC in the Black and Gold Breakdown before going into Stoppage Time with Producer Mario. Dave Denholm is joined by USMNT Legend and new Las Vegas Lights manager Eric Wynalda to talk about losing his home in the Woolsey Fire. Former LAFC assistant coach Marc Dos Santos is pumped for his new job as manager of Vancouver Whitecaps FC. Plus, Stoppage Time with Mario Ruiz. Dave started off with a take on Jose Mourinho and the "taunting" hand gesure he gave after Manchester United's win vs Juventus. Plus, LAFC Vice President and General Manager John Thorrington came on to talk about the team's first season and how successful they were even though they lost in the Playoffs. And, from the LAFC Digital side, Vince La Rosa, joined Dave for the "Black and Gold Report." Then, everyone's favorite segment: "Shootout." Dave Denholm starts the show by discussing the ugly MLS Cup playoff match between LAFC and Real Salt Lake. Calling out the rowdy fans who disrupted the game as well as the referees for their officiating. LAFC TV play by play commentator Max Bretos joins Dave to discuss the LAFC loss and look forward to next season. Dave also recaps the Galaxy season with Josh Guesman, host of Corner of the Galaxy podcast. One win to win the West for LAFC and one win to get in the Playoffs for LA Galaxy, Dave Denholm previews this huge weekend in MLS. LAFC Midfielder Benny Feilhaber joins the show for Black & Gold Breakdown. Plus, Galaxy president Chris Klein calls in to talk Playoff hopes. Dave opened up the show by having ESPN's Sebastian Salazar on to talk Team USA and how they did in their friendly vs. Peru. Plus, Dave talked about how Team USA can qualify for the 2022 World Cup. And, the "Black and Gold Breakdown." Also, "Stoppage Time" with Producer Mario. Dave Denholm came out on fire, as he talked about the friendlies going on at various places around the world, including the United States taking on Columbia. Dave talked to LAFC Head coach Bob Bradley about making the playoffs, and having a bobblehead made in his image. Denholm praised Zlatan Ibrahimovich's hot start and talks MVP. Dave Denholm asked Head Coach Bob Bradley how it felt to make the playoffs. Bradley praised his team's effort on the pitch in their last game against Colorado. The MLS Playoff race is heating up as LAFC jockey for a top spot and LA Galaxy try to squeeze in. Vince La Rosa from LAFC Digital joins Dave Denholm on the latest edition of Black & Gold Breakdown. Denholm talks about the tough times at Manchester United with Man U fan and ESPNLAâ€™s own Mike Trudell. Plus, Stoppage Time. Dave Denholm opened up the show talking about LAFC's chances for the playoffs and what seed they could land in. LAFC Vice President and General Manager John Thorrington came on with Dave to talk about vision he had for this team before the season started. Also, "Corner Of The Galaxy" Host Josh Guesman came on with Dave to talk about the MLS Playoffs. Plus, "Stoppage Time." Zlatan Ibrahimovic gets his 500th career goal with an amazing volley, Dave Denholm reacts. ESPNFCâ€™s Tom Marshall joins the show with the latest on the rumors of Chucky Lozano to Barcelona. Dave talks about LAFC battling for a top Playoff spot. Plus, Stoppage Time with producer Mario Ruiz. Dave started off the show talking about the MLS Playoff situation. Dave also thinks that LAFC is "trending up" while the LA Galaxy might be "going backwards" in their respective playoff pushes. Dave also previewed Team USA's friendlies with Brazil and Mexico. LAFC Midfielder Benny Feilhaber also called in to talk about the next generation for US Soccer and the difference from playing with the National Team and playing in the MLS. Dave Denholm reacts to Laurent Ciman leaving LAFC. Vince La Rosa joins Dave for the Black and Gold Breakdown talking about LAFC transferring defender Laurent Ciman To Dijon FCO. Dave talks about the retirement of US Mens Soccer legend Clint Dempsey. Dave rips Manchester United's Jose Mourinho on new one and it's Stoppage Time with Producer Mario. Dave Denholm recaps what has happened between growing rivals LA Galaxy and LAFC. He is joined by LAFC Goaltender Tyler Miller for the Black and Gold Breakdown. The newly formed rivalry between the Galaxy and LAFC is already one of the best in Los Angeles. Dave Denholm started off the show wondering why there is so much "hate" for the MLS. Denholm also looked back on LAFC's shutout of Real Salt Lake and the use of VAR in soccer. LAFC Forward Christian Ramirez called in to talk about his first 2 goals in the first start after getting traded to LAFC just a week and half ago. Plus, "Stoppage Time." Dave welcomes ESPN's Max Bretos for the Black and Gold Breakdown as the boys discuss the latest news of LAFC. Dave updates us on LA Galaxy and gives our listeners an extended Premier League news fix and it's Stoppage Time as Producer Mario and Dave kick around the top news stories in soccer. Dave Denholm brokedown last week's LAFC loss to the LA Galaxy. Denholm also talked about the MLS All-Star game that saw the MLS All-Stars lose to Juventus. Our own Dr. Klapper came on to talk about Mark Anthony-Kaye's fractured ankle. Then, MLSSoccer.com's Alex Dwyer came on with Dave to talk about what to expect now from LAFC after last week's lost to the LA Galaxy. And, "Stoppage Time." LAFC and the LA Galaxy will clash again tomorrow, so Dave Denholm previewed everything around the matchup. Denholm also had some commments from ESPN's Taylor Twellman and Adrian Healey on LAFC vs LA Galaxy. LAFC Midfielder Mark-Anthony Kaye came on with Dave to talk about his season so far and "El Traffico II." Dave investigates the Portland Timbers filing a formal protest over their 3-2 loss to LAFC in the 2018 Lamar Hunt U.S. Open Cup quarterfinals. Following the match LAFC forward Adama Diomande alleged on social media that a racial slur was directed toward him. Tim Howard of the US Men's Nat'l team and Colorado Rapids comes on and recaps the World Cup and his favorite moments in his career. Manchester United legend Dennis Irwin comes on and looks at the current style of play in soccer. With England losing in the Semi-Final to Croatia, Dave Denholm thinks USA Soccer can be "every bit as good" as England's National Team. Our own Mike Trudell came on to give his reaction to the World Cup Final with Croatia taking on France. The fellas also gave their predictions for Sunday's Final. Dave Denholm opened up the show reacting to Croatia coming back from a 0-1 deficit to beat England to advance to the World Cup Finals vs. France. Alex Dwyer from MLSSoccer.com came on to talk about his experiences in Russia for the 2018 World Cup. Also, "Stoppage Time." Dave Denholm looked back on France's 1-0 victory over Belgium in the Semi-Finals of the 2018 World Cup. Former Team USA Goalkeeper and ESPN Soccer Analyst Kasey Keller came on with Dave to talk World Cup and playing the game through a Goalkeeper's perspective. Also, our own Mike Trudell came on to give his thoughts on France getting past Belgium and the upcoming Croatia/England Semi-Final matchup. Dave recaps the recent matches in the World Cup along with the upcoming ones tomorrow. US Mens Soccer 1994 Team member Eric Wynalda comes on and talks World Cup with Dave and how it feels to play in a tournament. Mike Trudell comes on and talks about the poor sportsmanship of the Columbia team against England and a preview of tomorrow's matches. The guys focus and preview on the Brazil Belgium showdown tomorrow and looking into the future the Brazil France matchup. Dave starts out with rumors swirling Cristiano Ronaldo will be leaving Real Madrid and signing with Juventus. LA Galaxy midfielder Sebastian Lletget comes on and talks about the team's recruiting of talent and the challenges he faces this year helping out the Galaxy, the focus down the line on the playoffs and more. Black and Gold Breakdown with Steven Beitashour, LAFC defenseman who talks about the tough tie against the Houston Dynamo, the status of the team at mid-season and the World Cup. Dave Denholm is fired up tonight and recaps the great day of matches between Japan and Belgium, then Brazil and Mexico. Is it time to break up Mexico... or they're just having a poor tournament. Mike Trudell calls in to give his take on today's exciting matches. Callers come in with their perspective on today's matches and their teams. Dave Denholm and Mike Trudell are excited to finally talk about the Knockout Stage, which starts tomorrow morning. Dave and Mike went through all the Round of 16 matchups and gave their predictions of who will get through to the quarterfinals. The duo agreed that Portugal/Uruguay could be a "head turner." The guys also broke down some "wacky stats" from Group Play. Dave Denholm and Mike Trudell reacted to the end of Group Play on Day 15 of the 2018 World Cup. Denholm had a crazy tie breaker idea that could be more exciting. The guys also gave their predictions for the games in the Round of 16. Dave Denholm and Mike Trudell reacted to Day 14 of the 2018 World Cup. The guys said that Mexico doesn't seem to be "scared" of Brazil, who they face in the first knockout round. Also. The "Spanish Voice of the Lakers" Pepe Mantilla came on with Dave and Mike to talk about Mexico advancing. Then, Dave and Mike gave their predictions for the last day of Group play and the first matches of the Knockout stage. Dave Denholm tackled Day 13 of the 2018 World Cup including Lionel Messi "finally showing up" for the tourney with a big game in Argentina's win vs Nigeria. LAFC Pregame Host and Fox 11's Pablo Alsina came on to react with Dave to today's action. Dave also took calls on today's action. Dave Denholm started off reacting to Day 14 of the 2018 World Cup. Denholm believes that every team in this tourney is "beatable" even the so-called favorites. Dave also believes Mexico will be "ok" after losing today in their last Group Play match to Sweden. Dave Denholm and Mike Trudell react to the second week of matches including today's match between Uruguay and Russia. Which teams advance out of Group A and B... Mychal Thompson comes on and has some questions for the guys about the World Cup. Does this poor WC for Messi a knock on his legacy... Is England that good... Why didn't the USA get in... The guys discuss the referee's gutless yellow card given to Ronaldo in the Iran / Portugal match. Mike and Dave preview the upcoming matches. Dave Denholm and Mike Trudell reacted to the 9th day of action in the 2018 World Cup. Both marveled in the play of Cristiano Ronaldo in the tournament. Fox Sports' and LA Galaxy legend Cobi Jones came on to talk World Cup with Dave and Mike. Also, Denholm makes a bold prediction for Mexico. Dave Denholm & Mike Trudell break down the match between Iran & Spain as Dave has a bone to pick with the Iran coach while Mike has issues with Portugal. Also, the guys heap praise on Ronaldo for a World Cup milestone while they question the play of Messi. Plus, the guys look ahead of the group stage and which teams could make a run. Dave Denholm and Mike Trudell reacted to what Dave called the "craziest day so far" in the 2018 World Cup. Trudell couldn't believe how many Columbians flew out to Russia for their match vs. Russia. ESPNFC's Sebastian Salazar called in to give the boys an update from Russia. Dave Denholm started off the show talking World Cup 2018 and the one thing he hates about the first couple days of the tourney. LAFC Manager Bob Bradley came on to talk to Dave about the "break" that LAFC has right now due to the World Cup. Dave also took calls on the World Cup and was joined by Producer Mario for "Stoppage Time." Dave Denholm and Mike Trudell react to the first week of World Cup matches. Pepe Mantilla, live from Mexico City comes on and talks about all the excitement south of the border, the Temblor Mexicano and the unbelievable win over World Champion Germany. Mike and Dave touch upon the surrounding storylines around the World Cup and the guys preview the upcoming matches. Dave Denholm marveled at who he calls the "Biggest Athlete On The Planet:" Cristiano Ronaldo. Denholm also had some observations about the first couple days of the 2018 World Cup. ESPN and LAFC TV Play-By-Play Announcer Max Bretos came on to talk about his predictions for the Cup. Plus, Mike Trudell came on to talk about what he saw in the 2nd day of action. The 2018 World Cup is here! And Dave Denholm and Mike Trudell reacted to the 1st game today with Russia shutting out Saudi Arabia. Also, the guys had their thoughts on the 2026 World Cup, which was awarded to North America(USA, Mexico, and Canada). Plus, should the USA cheer for Mexico to win the World Cup? Dave and Mike took calls on the topic. Also, the boys made their predictions for the World Cup. With the 2018 World Cup literally hours away, Dave Denholm broke down who are the "Contenders & Pretenders" of this year's Cup. Dave had callers give their predictions for the World Cup. Denholm also gave his winner for the 2018 World Cup. Dave was joined "off the bat" by his friend Carlos Torres to talk World Cup Soccer, which is just around the corner. Dave and Carlos broke down the different groups and what "darkhorses" who could emerge in the tourney. Our own Mike Trudell came on with Dave to give a huge annoucement and to talk World Cup Soccer. Plus, "Stoppage Time"
With the World Cup a few weeks away Dave Denholm gives his early preview. This week he looks at the teams in Group F, B, D, and H. With several LAFC players going to Russia for the World Cup, they face a crucial stretch which they need wins. Sebastian Salazar of ESPN FC joins to discuss the World Cup. Dave also discuss the announcement of FC Cincinnati before going into Stoppage Time with Mario. Dave Denholm recaps the situation surrounding Galaxy forward Zlatan Ibrahimovic and Montreal Impact winger Michael Petrasso. Former soccer player Brian McBride joins to discuss the UEFA Champions League final between Real Madrid and Liverpool. Also, Dave gives his positives from the friendly between LAFC and Borussia Dortmund. Stoppage Time with Producer Mario. Dave Denholm started things off wondering what will happen with the LA Galaxy and their 15 Year-Old Prospect in Efrain Alvarez. Denholm thinks LAFC plays a "great band of football" the way they have been playing lately. ESPN FC's Tom Marshall came on the show to talk to Dave about gearing up for this Summer's World Cup. Plus, "Stoppage Time." Dave Denholm started off with the surging LAFC and the declining LA Galaxy. Dave also reacted to the news of Wayne Rooney joining the MLS with the DC United. Plus, talk on "El Trafico." Also, Dave and Producer Mario broke down LAFC's win vs. Minnesota. Dave Denholm took us back to the weekend as he discussed LAFC's win in their "Stadium Opener" vs the Seattle Sounders. Plus, Denholm had some thoughts on the Champions League. MLS Soccer Writer Alex Dwyer came on to talk about the big trade that LAFC made with the New England Revolution. Plus, LAFC EVP of Soccer Operations and General Manager John Thorrington came on to talk about the roster changes. Dave Denholm started off the show talking LA Galaxy, as he thinks they have a "huge decision" to make about their roster. LAFC Midfielder Benny Feilhaber called in to talk to Dave to talk about the season so far after the 1st 6 games. In the Black and Gold Report, Dave and Producer Mario "breakdown" the food at the new Banc of California Stadium. Dave Denholm starts the show by tipping his cap to LAFC and the Galaxy who won their matches this past week. Banc of California Stadium had their ribbon cutting ceremony today. Dave gives his first impressions on the new stadium before playing clips of people he interviewed there. Stoppage Time with producer Mario. Galaxy and LAFC both lost last week as Dave Denholm says both teams in an El Trafico hangover. One player on the Galaxy has made the MLS significantly better, but not the player you think. Dave recaps the ugly LAFC lost to Atlanta United. Can the LAFC offensive click again against the Whitecaps? Brek Shea, Whitecap midfielder joins Dave to talk about his journey in soccer, playing in Vancouver, and his thoughts on LAFC. Dave Denholm recaps El TrÃ¡fico which he says was one of the greatest games he has ever seen. He also describes the scenery going into the StubHub Center and how everything changed once Zlatan IbrahimoviÄ‡ subbed in. LAFC unveiled their new training facility located at Cal State University-Los Angeles. Dave and Mario give their thoughts on the facility before getting some of the player's reaction. Dave is really excited that Zlatan Ibrahimovic is joining the LA Galaxy after a storied International career. LAFC's Walker Zimmerman came on with Dave to talk about this weekend's matchup with the LA Galaxy in the "LA Derby." Also, LA Galaxy Technical Director Jovan Kirovski joined Dave to talk about the process of Zlatan Ibrahimovic joining the LA Galaxy. Plus, "Stoppage Time." Dave Denholm started off the show reacting to the Champion League Draw. Dave then talked about the ESPNFC MLS Poll on who is the most overrated/underrated players. LAFC Rookie Defender Joao Mountinho came on with Dave to talk about how he's adjusting to the MLS in his 1st year. LA Galaxy Goalkeeper David Bingham talked to Dave about adjusting to the city of LA after spending 6 seasons in San Jose with the Earthquakes. Dave Denholm started off discussing how the two local teams, LAFC and the LA Galaxy, did in the first week of MLS action. LAFC Defender Steven Beitashour came on with Dave to talk about his great game against Real Salt Lake and "LA Derby." Plus, everyone's favorite segment, "Stoppage Time." What a start for LAFC as they get a win at Seattle in their first game in franchise history. Dave Denholm tells you which league is better between MLS and Liga MX. ESPN's Sebastian Salazar calls in to talk about LAFC's historic win, MLS vs. Liga MX and more. Plus, Stoppage Time! New LAFC TV Play-by-Play Man Max Bretos came on with Dave to talk about the crazy expectations the LAFC have for their inaugural season. Plus, with the MLS days away from the 2018 season, Dave broke down what to expect from the 23 MLS teams. Also, everyone's favorite radio segment, "Shootout." Dave Denholm is excited because the MLS is only 9 days away! Denholm previewed who he expects to be "contenders" and "pretenders" for the upcoming 2018 MLS Season. LA Galaxy Midfielder Sebastian Lletget came on with Dave to talk about the upcoming season and the new crosstown rivalry between the LAFC and the Galaxy. Plus, everyone's favorite segment, "Stoppage Time." Dave Denholm came out on fire, as he strongly disagrees with the choice for US Soccer President, Carlos Cordeiro. Denholm took calls on the subject, in which many callers agreed with him about the choice for U.S. Soccer President. Plus, everyone's favorite segment, "Stoppage Time." Dave Denholm came out the gate talking Champions League Soccer, which is in their Round of 16. LAFC's Walker Zimmerman came on to talk the first LAFC scrimmage and Team USA Soccer. Plus, Dave talked presidential candidates for the USA Soccer. Dave Denholm came out on fire as he reacted to Zlatan Ibrahimovic, formerly of Manchester United, signing with the LA Galaxy. Denholm thinks that even though he's old, Ibrahimovic will be great for the Galaxy. Also, former LA Galaxy player and US Soccer Federation Presidential Candidate Kyle Martino came on to talk to Dave about his Presidential bid. Plus, everyone's favorite, "Shootout." Dave Denholm was joined by LA Galaxy Manager Sigi Schmid as they talked about the new look Galaxy and their chances to win the MLS Cup in 2018. Also, LAFC's Jordan Harvey came on to talk about the inaugural season of LAFC, excitement surrounding the team, and coming home to play soccer after playing in Vancouver for the last 6 years. Plus, "Stoppage Time." Dave begins talking about Politics and how the U.S. may not be eligible to bid for the World Cup 2026 because of President Trump. Tom Marshall calls in to talk about Landon Donovan joining Leon Football Club. Dave talks about FIFA being corrupt and how they don't want MLS to Grow, Dave and Mario wrap with Stoppage Time. Dave Denholm reacts to the breaking news surrounding Landon Donovan. Several sources are saying that Donovan is coming out of retirement and has signed with Club LeÃ³n in Liga MX. The newest member of LAFC, midfielder Benny Feilhaber joins Dave to discuss his surprising move to LA from Kansas City and what he expects in LAFC's inaugural season. Listeners call in and give their thoughts on Landon Donovan coming out of retirement. 2018 starts season three of Soccer Weekly with Dave Denholm. Fox Sports broadcaster, Francisco X. Rivera joins Dave to discuss Mexico's World Cup preparation. Despite being a new year, Dave's worries for his Galaxy remain the same, bleak. Especially with LAFC on the horizon. The best soccer news in Stoppage Time with Producer Mario. Dave Denholm dives into the good, bad, & ugly of US Soccer this past year with special guest Carlos Torres of Cal South as they break down what went down and what is still to come for the beautiful game. Dave Denholm begins talking about MLS expansions, What cities deserve an MLS team? Also, ESPN Soccer Analyst Taylor Twellman calls in to talk about US soccer presidency, MLS expansions and LAFC signings. Dave goes over the draw of the CONCACAF Champions League. Dave and Mario Wrap it up with Stoppage Time. Dave Denholm reacts to Toronto FC winning the MLS Cup, as he wondered if this Toronto team is just as good as any past MLS Champion. Dave also had his thoughts on the FIFA Club World Cup and how he wants a MLS team in this competition. Plus, a Toluca/Pachuca update and "Stoppage Time." Dave Denholm is live discussing the LAFC Expansion Draft. Dave looks at players taken and talks about what they bring to the team. One of the newest members of LAFC, defender Walker Zimmerman joins Dave to discuss his emotions in joining the team. LAFC Manager Bob Bradley joins Dave next to discuss what kind of players he wants on his team. Next Dave brings on GM, John Thorrington. ESPN Soccer Analyst and US Soccer Legend Kasey Keller came on with Dave to talk about the MLS Cup and the state of US Soccer. Denholm also took calls on the MLS and the various leagues around the world. Plus, everyone's favorite: "Stoppage Time." Dave Denholm begins talking about the negative comments from former LA Galaxy player Jermaine Jones. Shahan Ahmed European football columnist for Yahoo Sports calls in talks about the state of the European leagues. More on the Jermaine Jones negative comments on social media plus, find out what English Premier League match brought Dave to boredom. The show wraps with Stoppage Time. MLS Playoffs are in full swing and Dave Denholm reacts to the first leg of the Conference Finals. 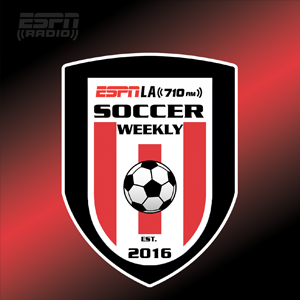 ESPNFCâ€™s Sebastian Salazar calls in to talk about all things MLS including the battle of LA between LAFC and LA Galaxy. Cristiano Ronaldo is fed up with the media! Plus, Stoppage Time with Producer Mario Ruiz. Dave Denholm reacted to the World Cup Qualifying Playoffs, which was "heartbreaking" for him to watch. Plus, New England Revolution Head Coach Brad Friedel came on to talk about his team. Also, LAFC Executive Vice President and General Manager John Thorrington came on to talk about the buzz about LAFC. Who does Dave Denhom consider the "JR Smith of Soccer?" Plus, "Corner Of The Galaxy" podcast host Josh Guesman talks about the state of the L.A. Galaxy and the MLS. Dave Denholm discusses the MLS Playoffs and Champions League and explains the backlash USMNT stars Jozy Altidore and Michael Bradley have been getting in regards to the National Team missing the World Cup. Dave Denholm talks about the MLS playoffs and U.S. soccer legend, Eric Wynalda, talks about his running for the U.S. Soccer presidency, the U.S. soccer coaching system and U.S. Women's success. Is the MLS relocating the Columbus crew? What teams will be a surprise in UEFA's Champions League? Plus, ESPN's Jeff Carlisle joins Dave to discuss the USMNT's failure to advance to the World Cup and U.S. soccer's presidency. What will be of Bruce Arena's legacy? Plus, Dave talks about the USMNT failure to advance to the 2018 World cup and how the organization can improve its coaching situation. The U.S. team has their backs against the wall going into their match up against Panama, Denholm explains. Dave breaks down the importance of the game, strategy the team should take & calls out Pulisic for good reason. Dave kicks off talking about Josh Sargent signing with Werder Bremen. ESPN FC, Sebastian Salazar calls in to talk about UNITED FOR EACH OTHER campaign to help out people affected by the recent Natural Disasters. LAFC GM and Executive Vice President John Thorrington, calls in to talk about the hiring of Bob Bradley as Head Coach, Carlos Vela and the scouting process for the team. Dave wraps it with Stoppage Time. The L.A. Galaxy proved once again they are the worst team in MLS as they suffered a loss in Atlanta on a 4 to nil loss, how fast can the team rebuild? Dave reacts. Plus, it's another edition of Stoppage Time! Denholm explains why he agrees with Alexi Lalas and his criticism of the USMNT and what he sees in the Champions League. Plus, L.A. Galaxy legend Kevin Hartman explains how the Galaxy can improve their current squad. LAFC President and Owner Tom Penn, calls in and talks about The stadium and future player signings. Dave talks about the US Mens national soccer team struggling to qualify to the World Cup. LA Galaxy Legend Cobi Jones, calls in to talk about the LA Galaxy struggles also he's surprised about some teams in the MLS. Cobi says he's still waiting for an apology from Mexico's Rafa Marquez. Stoppage Time. Spy-Gateâ€¦ Deflate-Gateâ€¦ now Pie-Gate? What was the reasoning behind signing Jonathan Dos Santos? Dave provides solutions on how to fix the LA Galaxy. Plus, Luis Omar Tapia talks about Champions League, the Mexican national team and MLS in Miami. Is video replay diminishing the sport of soccer? Dave Denholm recaps the Galaxy loss to Columbus Crew and how use of video replay in soccer is impacting the game. Plus, it's another edition of Stoppage Time. Dave Denholm recaps the Galaxy loss to Columbus Crew which was all about the use of video replay. Is it diminishing the game? The audience tweets and call in to Dave to discuss the use of video replay in Soccer. Stoppage Time with Producer Mario. Is $64 million too much for Danny Rose? Plus, Dave Denholm talks about the 2017 Super Cup between Barcelona and Real Madrid, stoppage time deals with the most valuable teams in MLS and the great Christian Pulisic. Los Angeles Galaxy are the WORST team in the MLS as Dave Denholm continues to discuss the woes for the Galaxy. He also previews the Premier League. Sebastian Salazar from ESPNFC joins Dave to discuss LAFC's first designated player, Carlos Vela. Staying with LAFC, Dave is joined by their manager Bob Bradley. Dave Denholm starts off this week discussing the firing of LA Galaxy head coach Curt Onalfo and the return of Sigi Schmid. LAFC hired Bob Bradley as their head coach for their inaugural season. Dave discusses the potential of Neymar going to PSG. Jonathan dos Santos is coming to Los Angeles to play alongside his brother as Dave Denholm discusses the big signing for the Galaxy. Despite the signing, Galaxy are still a team in need. Tom Marshall covers La Liga MX and El Tri for ESPN FC as he joins Dave to discuss the latest news in La Liga as well as the moves by dos Santos and Chicharito. Dave Denholm discusses the 2-0 USA win over El Salvador to advance to the semifinals in the Gold Cup. He is surprised that players are still biting each other. Vincent Kompany from Man City and the Belgian National team joins the show to discuss the upcoming Premier League season. Dave gives his one word to describe the LA Galaxy. Dave Denholm starts the show discussing the woes of the Los Angeles Galaxy. Despite the youth of the Galaxy, this is NOT the team of the future. Wayne Rooney to Everton, James RodrÃ­guez to Bayern Munich, and Dani Alves to PSG are some of the moves he discusses. Dave informs a listener why the US teams never seem to improve. Dave Denholm is livid with how the LA Galaxy got destroyed by Real Salt Lake. Germany are Confed Cup champs while Mexico is looking towards the future. FS1's Francisco Rivera joins Dave to recap the Confed Cup & help preview the Gold Cup. Denholm recaps the FIFA Confederations Cup match between Mexico and New Zealand and mentions three letters that could change the sport as we know it. Plus, Dave discusses some big L.A. soccer rumors in Stoppage Time. Dave Denholm is mad to start the show due to the USA/Mexico draw last weekend. USA should have more confidence when facing Mexico. Listeners call in and give their thoughts on the match. Stoppage Time takes Mario around the hottest topics in the world of soccer. In what Dave Denholm calls an impromptu post game show, as the US Mens Soccer team beat Trinidad and Tobago 2-0 under the performance of 18 year old sensation Christian Pulisic. Dave has high praise for Pulisic. A Toluca/Pachua update with the recent Liga MX Draft and CONCACAF teams are on the rise. Dave Denholm congratulates the Chivas on their victory over Tigres in the Liga MX Clausura and explains how Juventus can beat Real Madrid this weekend in the Champions League Final. Plus, Dave reads tweets and calls on everything soccer. Denholm discusses Manchester United's win over Ajax in the Europa League Final and comments on the Liga MX final between Chivas vs Tigres. Plus, Dave explains why soccer is not as big in the U.S. compared to the rest of the world. Dave Denholm thinks there is a new superclub in the MLS. The first guest of the season joins the show. Herculez Gomez joins Dave to discuss Liga MX and MLS. Is the Premier League overrated? Dave takes listeners reaction on the matter. Stoppage Time takes Dave and Mario around the world of Soccer. Dave Denholm kicks off the show discussing the Champions League. Is Juventus the real deal? Dave is surprised by a move that Galaxy manager Curt Onalfo made. Dave rants about the latest attack against the MLS. Dave and producer Mario discuss the latest news in the Soccer world with Stoppage Time. Dave Denholm is back for the second season of Soccer Weekly as he dives right into the problems that his LA Galaxy are having. Will LAFC take the place of the Galaxy for soccer fans in LA? Dave opens the phone lines for the very first time as listeners call in to discuss all things soccer with Dave. Dave Denholm starts the show talking about the Club World Cup Final match up between Real Madrid and Kashima Antlers. Dave says no one cares about the Club World Cup and makes his case to FIFA to try make the Club World Cup more popular. He also recaps what happened in the soccer world in 2016. Dave Denholm starts the show recapping the MLS Cup. Dave thinks Toronto was the beater team despite the loss. Curt Onalfo is the new coach of the LA Galaxy and Dave addresses the state of the franchise. Dave takes a look at the draws from the first round of 16 in the UEFA Champions League. The MLS held an expansion draft this week for new teams, Atlanta United FC and Minnesota United FC. Dave discussed what happened. What team should you keep an eye out for in the Champions League? Dave Denholm talks Champions League Round of 16 and previews the MLS Cup match up between Seattle and Toronto. Plus, Dave explains why this is crucial time for the L.A. Galaxy. Soccer Weekly is back! Dave Denholm discusses the MLS Cup match-up between Seattle and Toronto. Also, Dave takes a look at the Galaxy's biggest needs for 2017. Dave Denholm wants to know how Jurgen Klinsmann is still the USMNT manager since there is no way the U.S. players respect him. Who would Dave like to see replace Klinsmann? Does Mexico have what it takes to win the World Cup? Plus, Dave Denholm explains why he is pumped for the final round of World Cup qualifiers and what's next for the L.A. Galaxy moving forward. The MLS playoff race comes down to the wire and what in the world is FIFA thinking with the possible expansion of the World Cup? Plus, why do superstars struggle to perform off the bench? Dave Denholm reacts to Abby Wambach's questioning of foreign-born USMNT players, gears up for the MLS Playoffs and talks about the L.A. Galaxy and American Soccer's great news. Plus, everyone's favorite Toluca/Pachuca update! Dave Denholm says it's a groundbreaking moment in American Soccer with Bob Bradley coaching in Swansea City. Can Bob Bradley turn the season around for Swansea? Dave talks World Cup Qualifiers. Plus, Dave's Toluca/Pachuca Update! England fires coach Sam Allardyce, Denholm reacts. How did Atlanta United land Tata Martino as their first head coach? Dave Denholm talks about his favorite Champions League matches from the weekend. Plus, Dave's Toluca/Pachuca Update! How beautiful was that run and goal by Landon Donovan? Plus, Dave Denholm explains why Steven Gerrard needs to step up and why the MLS cannot seem to develop young players into world class stars. Dave Denholm explains why Landon Donovan should not have come back to the LA Galaxy and provides a Champions League match day 1 recap. Is Barcelona the best team in all of sports? Plus, it's the Toluca/Pachuca update. Dave Denholm says the USMNT has found the next Landon Donovan. US starts the final round of world cup qualifying against Mexico. Alejandro Bedoya goes off on Eric Wynalda, Denholm reacts. Is former Dodgers' owner Frank McCourt getting into soccer? Plus, Dave Denholm talks about L.A. Galaxy, the termination of Nigel de Jong's contract and upcoming U.S. World Cup qualifying matches.